The Benefits of Taking Time Off From Work | Valet. What Would You Do If You Could Play Hooky? When someone asks how you're doing, is your answer something like “I'm dragging,” or “Man, I'm so busy”? If it is, you're not alone. We know that Americans are over-stressed and under-slept, we're more connected than ever before which means we can feel constantly chained to our responsibilities both at work and at home. We'd all like to have a day, just to ourselves, to do whatever we'd like, but few of us ever take it. In fact, in 2017, American workers gave up over $62 billion dollars in benefits alone by forfeiting approximately 212 million viable vacation days. Even if you don't have the money to travel, you should still take time off—especially the time you've earned. Imagine just one day off to do anything you want to do. Maybe you use it to catch up on the things you don't have the time or energy to do during your normal schedule. Maybe you use it do something new and adventurous. Or perhaps you use the day to sleep in, read a book and indulge in some serious self-care. All you have to do is think of the things you want to do, but aren't doing right now. And while it might seem foreign, taking a day to rest is anything but irresponsible or lazy. It's not selfish to carve out some time to do something you enjoy—this is what compensates for the parts of your life you can't control. Over the past few years, the science has grown to support these claims about the power of a day off. Herewith, four ways that playing hooky can do your body, mind and career good. This seems small, but there's something empowering about deciding to take some time for yourself. Especially when you fill your day off with things you love, it triggers your brain's reward center. This is an easy way to indulge yourself with little things you deserve. Go hit some golf balls or see a movie. Maybe crack open the bourbon you've been saving for a special occasion. The idea is to treat yourself. The National Institute for Occupational Safety and Health reported to the CDC that stress levels at work are higher than ever, and chronic stress has been proven to weaken your immune system. A shot of rest and relaxation won't erase all the stressors from your daily work life, but it will give you a break (and just knowing that you've got a day off coming can do wonders for your stress levels). When you're burnt out, you're not thinking clearly, coming up with inventive new ideas or stumbling upon creative breakthroughs. But a long-term study found that cognitive flexibility, the component of creativity that creates the ability to adapt our thinking to face new and unexpected conditions in our environment, can be boosted by simply taking time off. In fact, another study found that rumination, a kind of anxiety that causes us to focus on what's distressing us (instead of thinking of solutions) actually lessons when our mind knows we're on vacation. And that the levels of those stress hormones stay low for about two weeks after taking time away from the stress. No one does their best work if they've got to be "on" all the time. Even the hardest working company men lose their enthusiasm if they feel like they're constantly working. The stress of the workday blends into the evenings and off-time, eating up recovery and rest time, according to Sabine Sonnentag, a professor at Germany's University of Mannheim. She's found that people who do not know how to detach from work during their off time experience increased exhaustion over the course of one year and are less resilient in the face of stressful work conditions. Sonnentag stresses how critical it is to learn to consciously detach from work and take time for yourself, suggesting activities such as exercise, walks in nature and total absorption in a non-work-related hobby. It all sounds almost too good to be true, right? Work less, be happier and up your productivity? But the health science backs it up. Along with global statistics. Data from the Organisation for Economic Co-operation and Development (OECD) confirms that working more hours results in less productivity. Two of the most productive countries are Germany and France—and both mandate more than 30 days of vacation. By contrast, the United States, where the average private sector worker receives about ten vacation days, clocks in under them as the third most productive. Could you imagine how productive and happy those workers would be if they had more time off? Or maybe just utilized the vacation days they had? If a whole day off isn't feasible right now, you can still reap some benefits by allowing yourself a few micro-breaks. 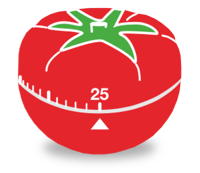 The Pomodoro Technique calls for 25 minutes of work alternated with five minutes of recreation. Not only does it allow you to feel like you've gotten some time to yourself, but it's been proven to help your subconscious efficiently problem solve.